ALERT: Global Airport Protests Right Now! Over 100,000 people marched in Oakland in the Women’s March. Over 200,000 marched in San Francisco’s Streets, over 2.6 million nationwide. Last night spontaneous demonstrations were held in airports all over the country protesting Trump's racist, fascist Muslim refugee ban, and in support of refugees formally cleared for arrival, but now stuck indefinitely in America’s friendly airports, unable to come and unable to go. 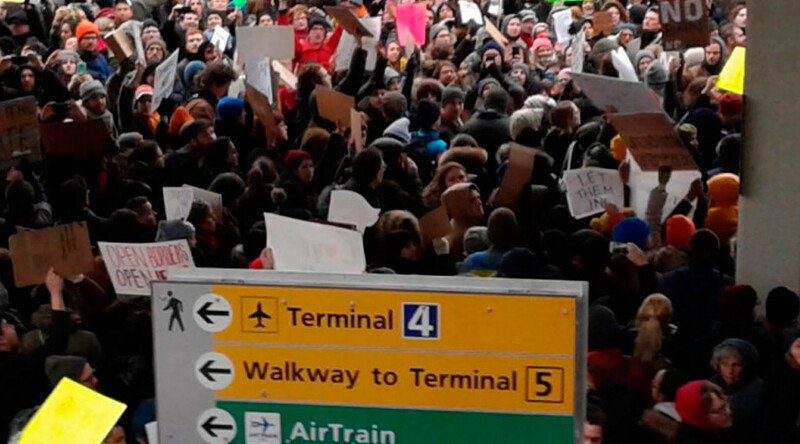 Thousands protested at JFK chanting “Let them in,” and “No hate, no fears, refugees are welcome here.” Hundreds more protested at Dulles, and at SFO, LAX, Denver, Miami, and Newark. After you get back, make sure to check out the incredible news summary at the bottom of this Newsletter on everything you may have missed in the past week! A Daily Kos article this past Thursday tells us why Donald Trump can’t function. Although she’s not a mental health professional, Karen Wehrstein’s screed attracted over 500 comments last I looked. 8. Is often envious of others or believes that others are envious of him, her or it. Over 500 comments keep pointing the finger at the poor person named Donald Trump, and miss the bigger picture altogether. So here’s a little exercise: According to the UN, the world includes 193 countries. What country exhibits all of the above 9 symptoms. Any idea? Could it be the problem is larger than someone named Donald Trump? Amendment 25 section 4 notwithstanding, if it’s hard to impeach a poor person named Donald Trump who’s in the wrong place at the wrong time, think how hard it must be to impeach a nation. 1. Coalition building: the great majority of the hundreds of thousands who marched on Women’s Day and the hundreds of thousands all over the country flocking to the airports yesterday and today are folks who’ve never sampled the joy of the streets before. We need to organize across ideology, and across identity politics to find our commonalities, and never put anyone down because of opinions they hold contrary to ours. We are all in this together. 3. Reading between the lines: We need to learn to “read” MSM (Main Suppression Media) between the lines. 4. Tweeting Made Easy: we need to learn the power of the tweet and why. When the marines invade other countries, their first act is to take down communications and the media. The new FCC appointee could kill net neutrality within weeks. Each e-mail you send will cost. We have no time to lose. Today, we face an unprecedented crisis of our national democracy. How we act in the next weeks, and how long before forces will be arrayed against us gives us a running start. We either let those in power dismantle the country or stand together in the thousand year war against humanity and the earth. 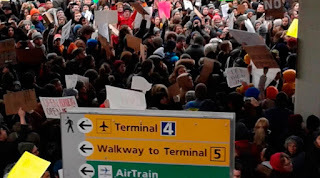 Twitter is currently the only “one to many” communications option available to us that can quickly scale up, especially when combined with resources like the J Street global Airport Immigration’s protests. For the older generation reading this, it will be absolutely critical that we become familiar with how to use Twitter, whose computer learning curve is the easiest to master. If you haven’t learned how to use Twitter, go here for the basics. • Trump Pick to Oversee White House Veto Threats Once Called Social Security and Medicaid "Unconstitutional"
• Trump Reinstates Global Gag Rule, Barring Funds for Abortion Education & Services | Democracy Now! • Will Trump's Claims of Election Fraud Pave the Way for an Assault on Voting Rights? | Democracy Now! • "The Media is the Opposition Party": Trump Adviser Steve Bannon Tells Press to "Keep Its Mouth Shut" | Democracy Now! • Trump made a lot of promises about what he will do as president. We’ve documented 663 of them. • Hundreds of Thousands Sign Petition to Impeach Trump for Violating Constitution over Biz Interests | Democracy Now! WILL TRUMP HUFF OR BLUFF TO BLOW OUR HOUSE DOWN?